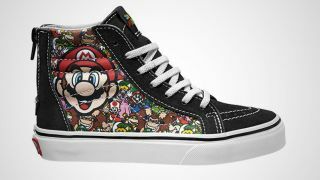 It looks like Nintendo is expanding its intellectual property-palooza to the shoe world with an upcoming Vans collection. Sneaker enthusiast site Sole Collector has posted images of several Vans shoe models from German sneaker store 43 Einhalb, adorned with familiar Nintendo characters and iconography. I love this Duck Hunt Camouflage shoe. It's a clever concept executed with just the right subtlety. The Legend of Zelda sprites make for a surprisingly natural moccasin-like effect. And this one may be my favorite, though I'm not sure what it's specifically referencing. It reminds me of old instruction manuals and map screens, and that's good enough for me.